Social Media planning and strategy is essential to grow your brand and engage with existing and potential customers on-line. Customers use social media platforms to inform their judgement of a brand or company – does the brand personality and brand values transfer on-line? I work with clients to select appropriate social media channels to build their brand personality. Every year sees the arrival of new channels such as snapchat and meercat but are they suitable for your brand ? Are your target demographics using these channels? They may be fashionable and cool but are they really suitable for your brand positioning! Its important to know that channels such as instagram and pinterest can be valuable drivers of traffic to your website. “But sure Pinterest is for fashion and interiors” I hear you say – not any more ! Pinterest, used correctly, can be a key building block of a strong social media strategy. 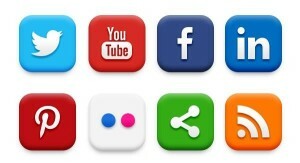 I will help you select the most appropriate social media channels for your business. I then work to ensure that all the names and handles are correctly formatted and your content is optimized for search engines.